The NW Colleges Regatta took place at Foyle Marina on Wednesday, 2 May 2018, and was the culmination of a short training programme for students and staff with a disability from Letterkenny Institute of Technology (LYIT), North West Regional College (NWRC), National Learning Network (NLN), and Ulster University, Magee campus (UU). LYIT's Raymond Gillespie with Barry at the NW Colleges Regatta. 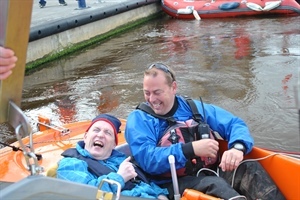 Sixteen representatives with a disability from four colleges across the North West competed in the first ever NW Colleges Regatta, sponsored by Foyle Port. The weather was favourable and the wind conditions made for an exciting event. After four heats, it was a nail-biting final between Trevor (NLN), Caolan (NLN), Reece (NWRC) and Gary (NLN, Letterkenny). The final was that close that it was a photo finish that determined that Gary took line honours, narrowly beating Reece from NWRC. Smiles from all competitors confirmed that it was a satisfying day for everyone who took part.